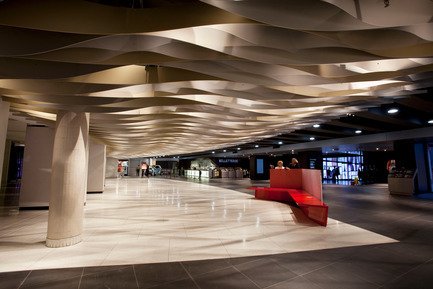 Lightemotion has been a key player in the revamping of the Espace culturel Georges-Émile-Lapalme in Place des Arts in Montreal for its 50th anniversary, working very closely with consortium architects Menkès Shooner Dagenais LeTourneux and Provencher Roy + Associés, under the artistic direction of Luc Plamondon, project manager for Place des Arts. 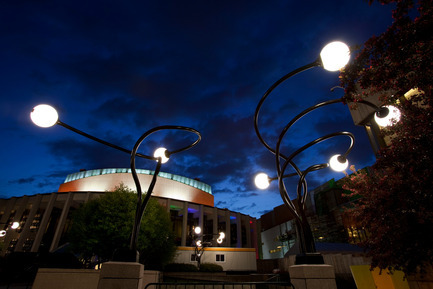 The revamping project, begun in May 2009, includes the renovation of all entrances and marquees for the five theatres in the Place des Arts complex. 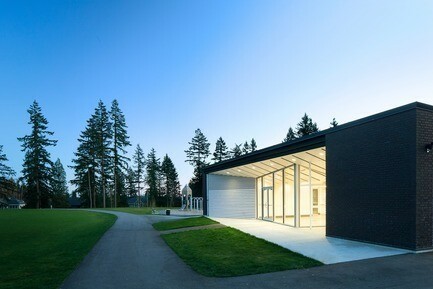 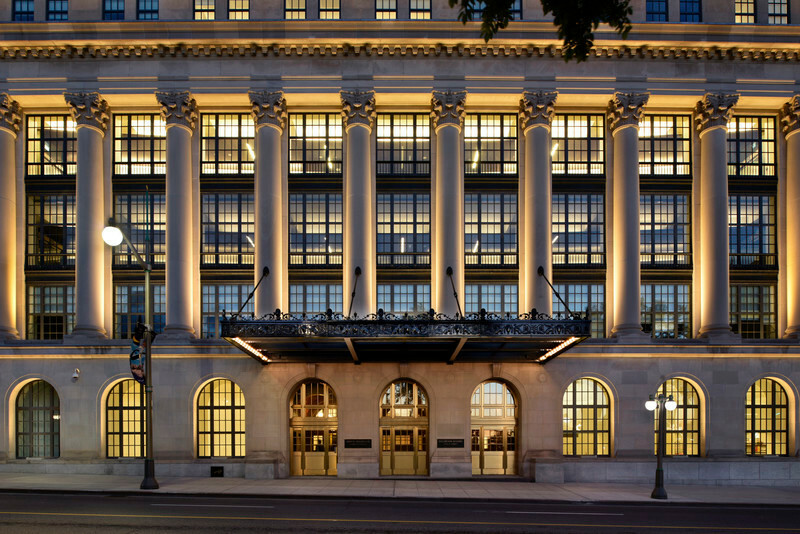 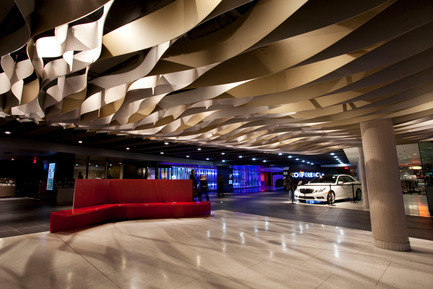 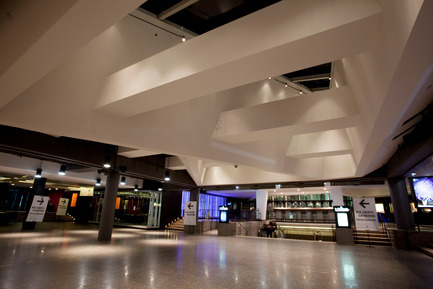 In addition, a box-office area, a multifunctional exhibit space, and a central theatre space under a series of immense skylights were created. 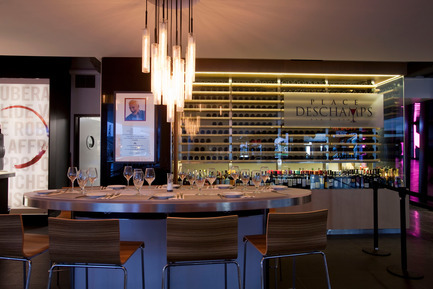 These changes made it possible to highlight the artwork by Pierre Granche, create a modern wine bar – Place Deschamps – equipped with a small stage, and set up a multimedia zone located in the renovated central corridor. 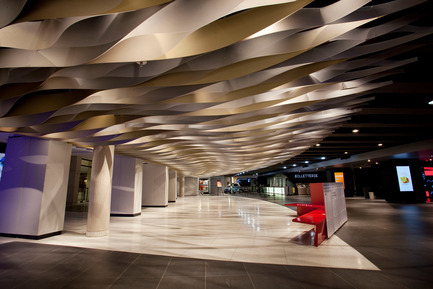 The project also includes changes to the outdoor facade of the main entrance and the esplanade. 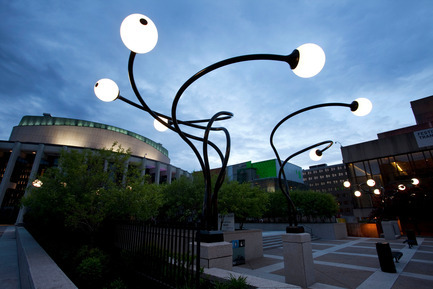 This has changed the look and feel of Place des Arts for all users. 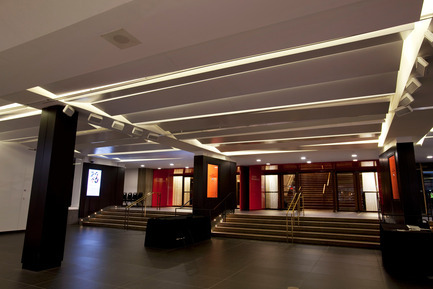 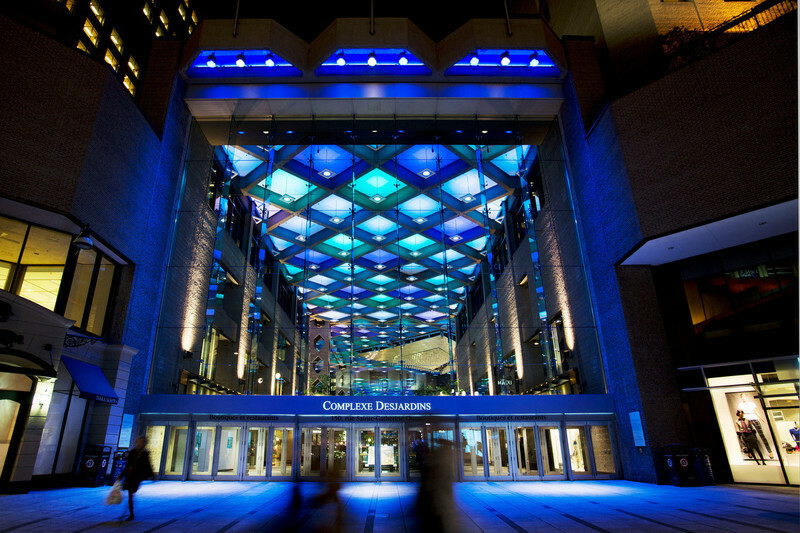 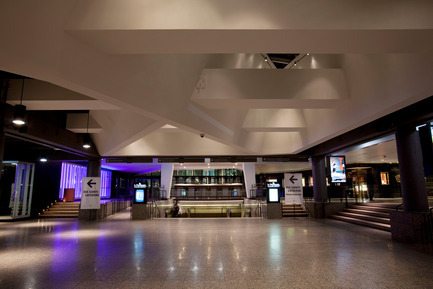 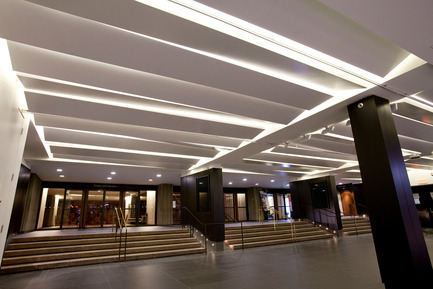 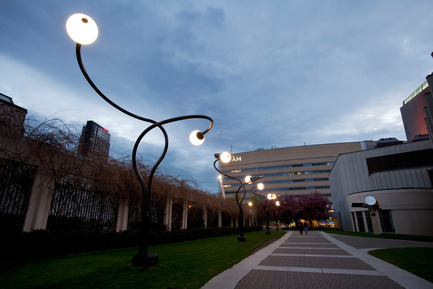 A large marquee embraces the main entrance, and the esplanade has been equipped with signature custom-made lampposts designed by Lightemotion specifically for Place des Arts. 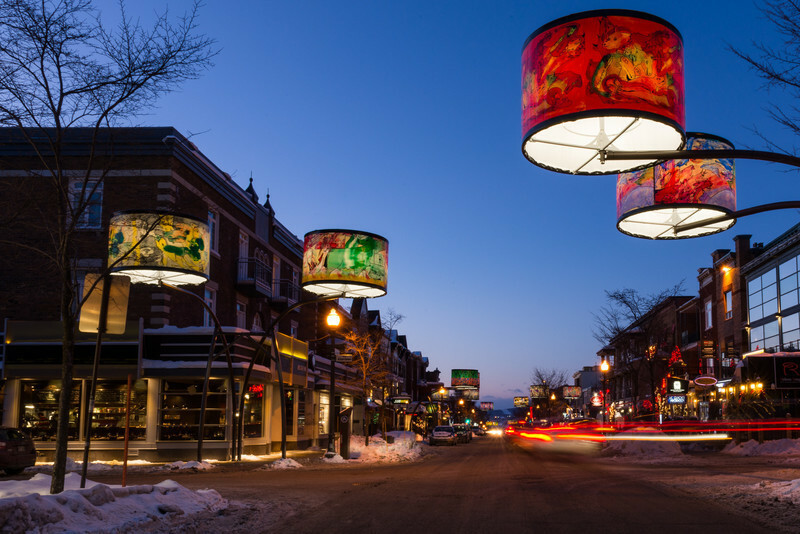 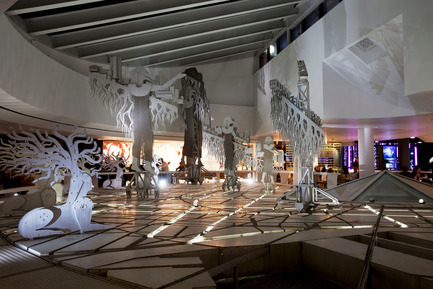 The key deliverables were focused on the creation of a flexible lighting system that would change at different times of day as the cultural space caters to different clienteles and activities. 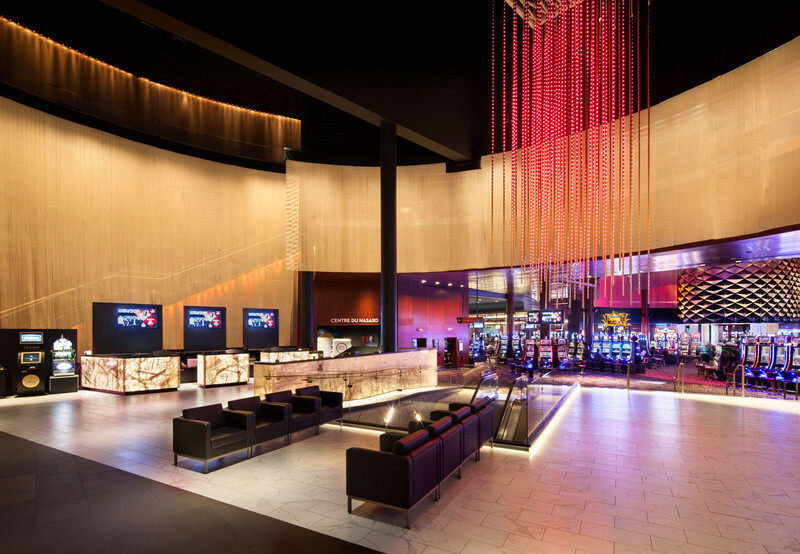 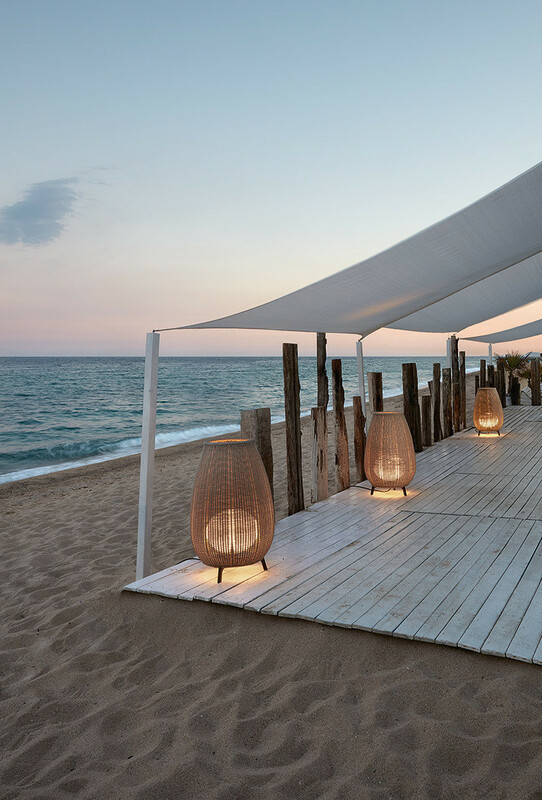 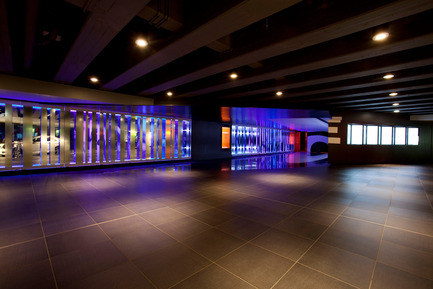 The main objective was to create a fusion between light and architecture, with lighting emanating from different elements to create a fuller and more integrated experience. 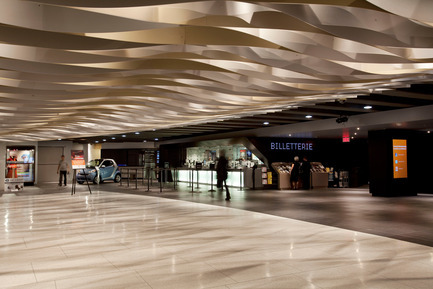 While delicate shades of light from various sources permeate the space, dynamic signature wall showcases modulate the visual environment throughout the day. 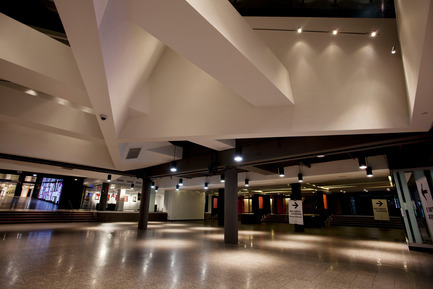 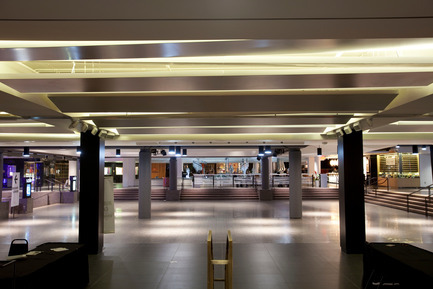 People passing through the Espace culturel in the morning hours experience a soothing, warm pulsing light. 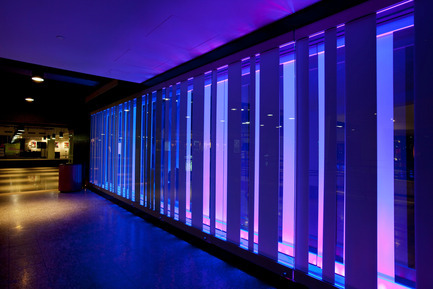 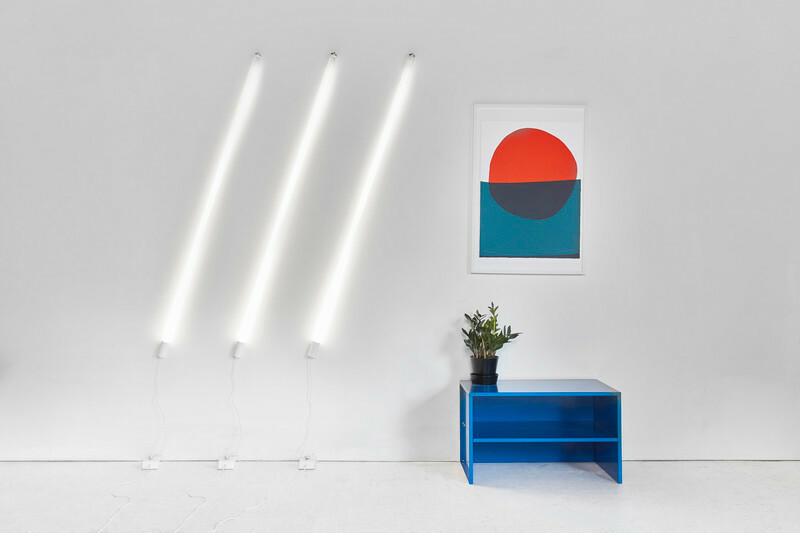 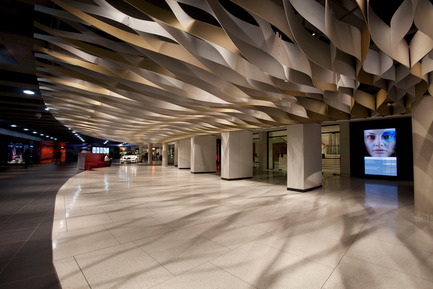 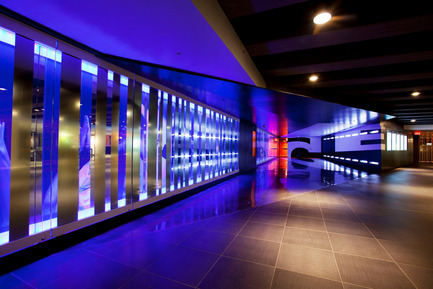 Later in the day, people passing through the space have a different sensory experience as the lighting creates more dynamic movements in vibrant hues. 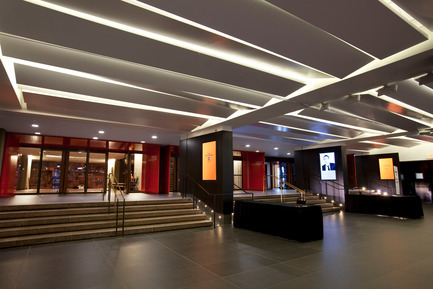 During the evening hours, the entire space is transformed into a contemporary performance centre reflecting the cultural activities in the five performance halls through various interactions of lighting dynamics that create subtle changes in the space. 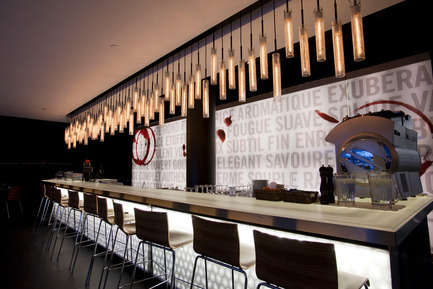 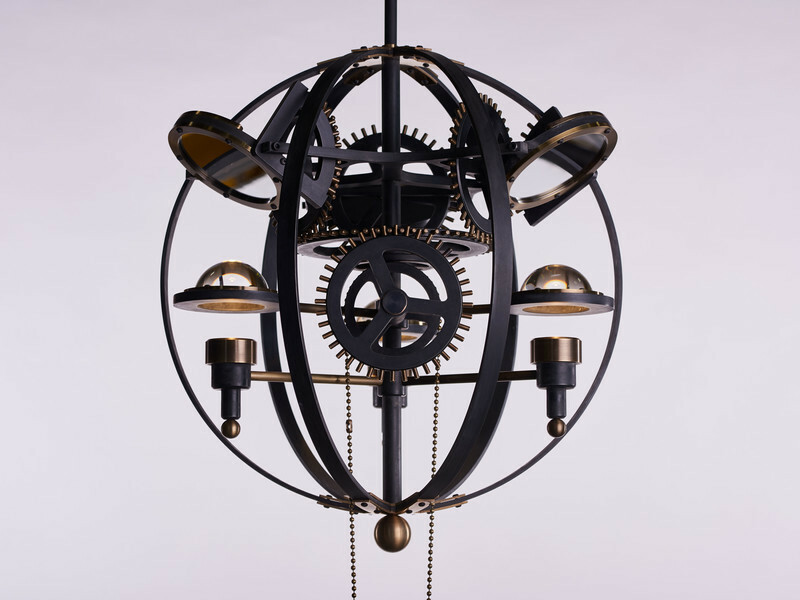 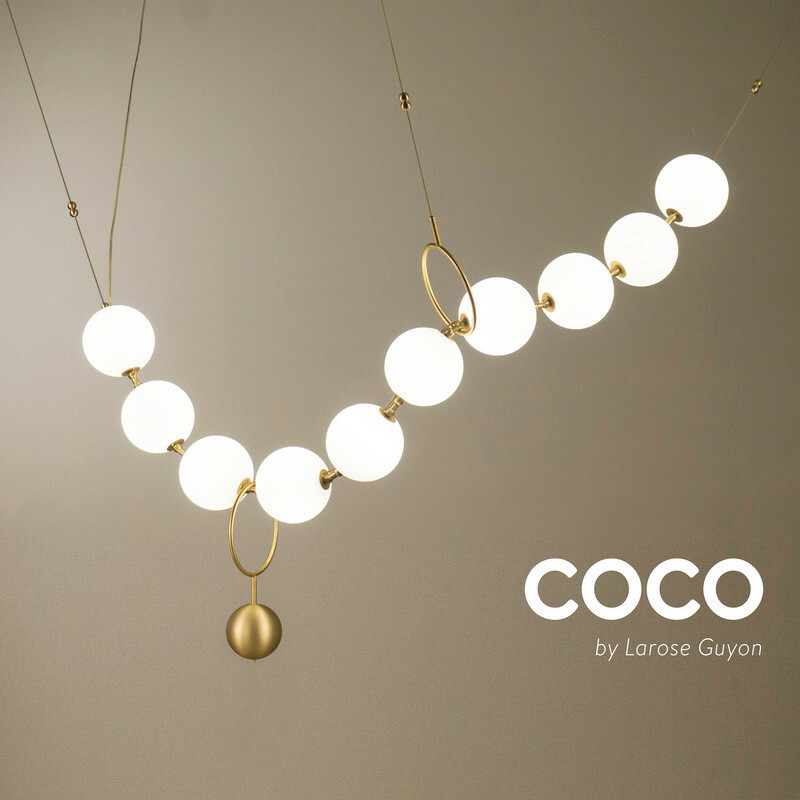 Custom fixtures were designed for all areas of the Espace culturel. 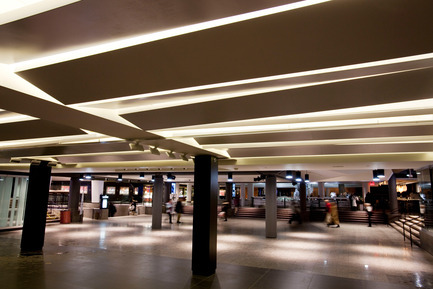 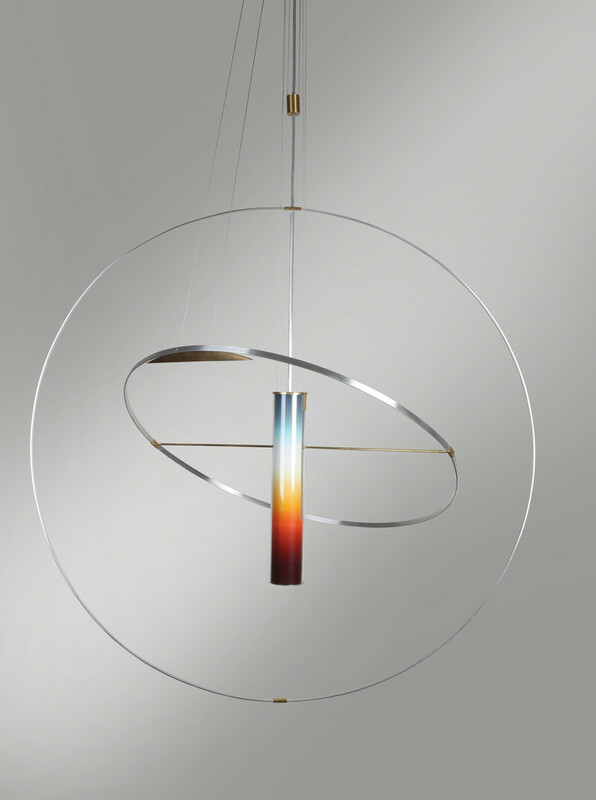 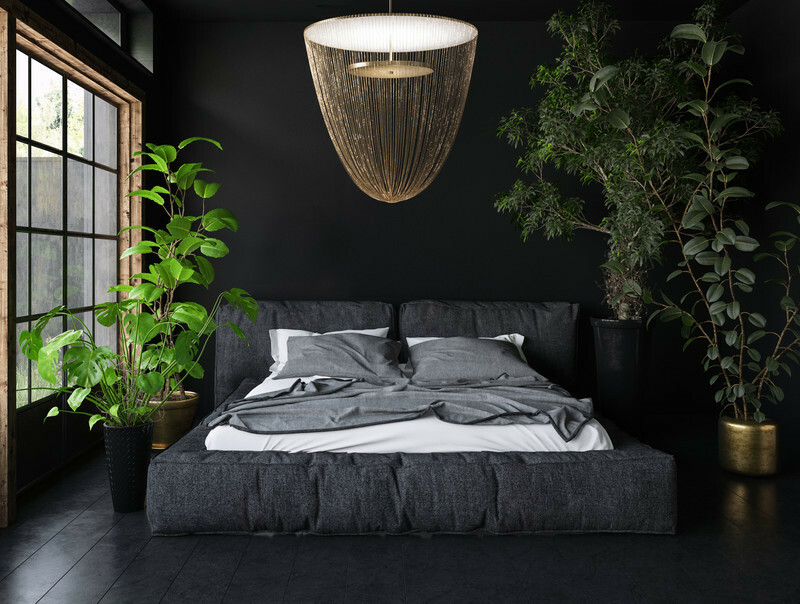 A signature downlight that incorporates a luminous LED disk serves as general lighting and also creates visual sightlines that define the space’s different areas. 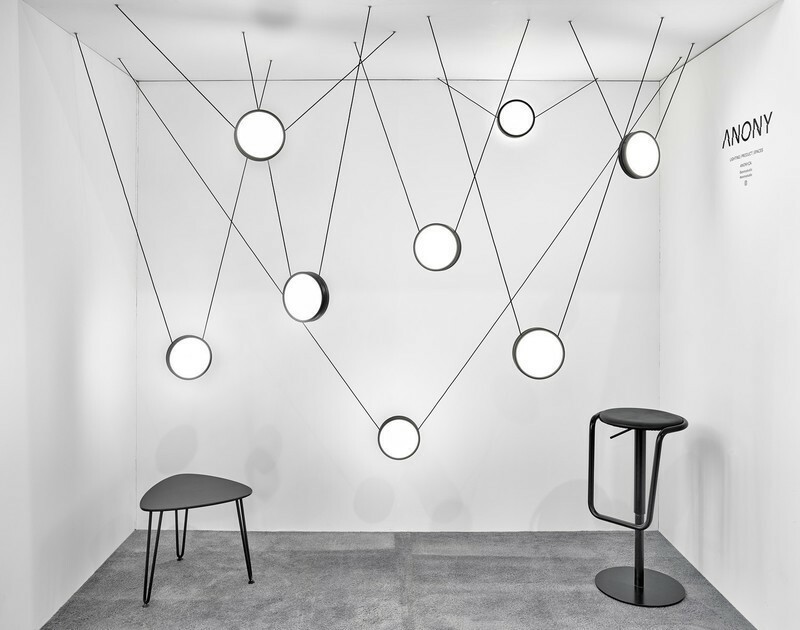 The luminous disks are individually controlled via DMX and create different movements and patterns, adding to the space’s visual signature. 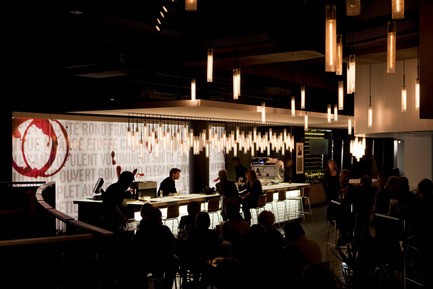 Special crackled-glass hanging fixtures were created for the wine bar; the fixtures are equipped with long bulbs with a “dancing” filament, once again generating subtle lighting movements that establish an intimate environment for all occasions. 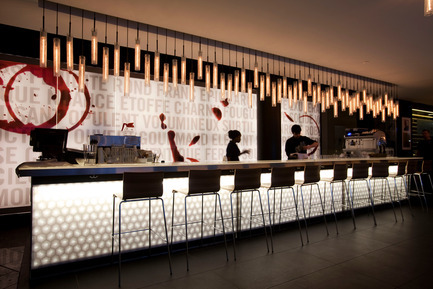 These fixtures are scattered around the area, and a cluster of them is placed over the lightest parts of the bar. 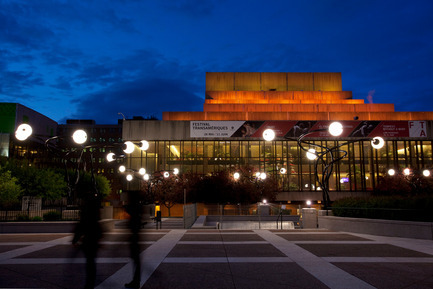 Place des Arts, a leading centre for all art disciplines and the featured cultural space in the heart of the Quartier des Spectacles, is also a daily hub for thousands of spectators, tourists, and users of the Montreal subway system. 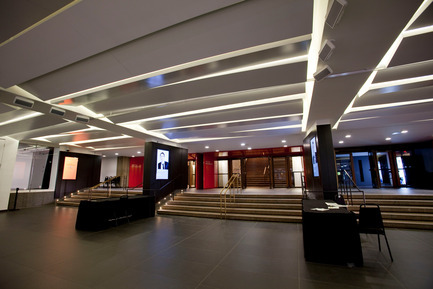 The Espace culturel Georges-Émile-Lapalme, with its vibrant décor and art program, is a welcoming place for all members of the public. 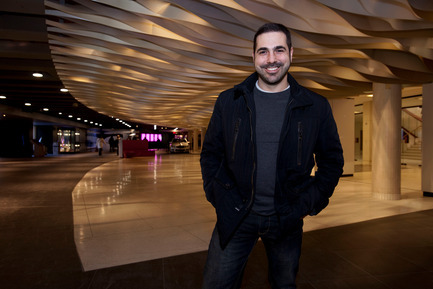 Montrealer François Roupinian has surrounded himself with a multidisciplinary and multicultural team, managing projects in five languages. 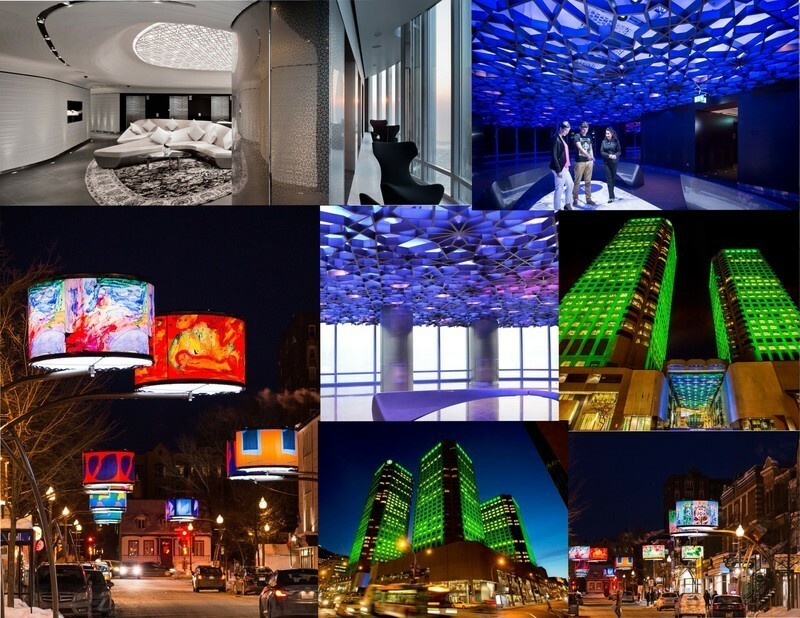 Lightemotion's origins are in the field of the performing arts and multimedia, and the company has expanded into other fields of expertise, such as architectural and museum lighting. 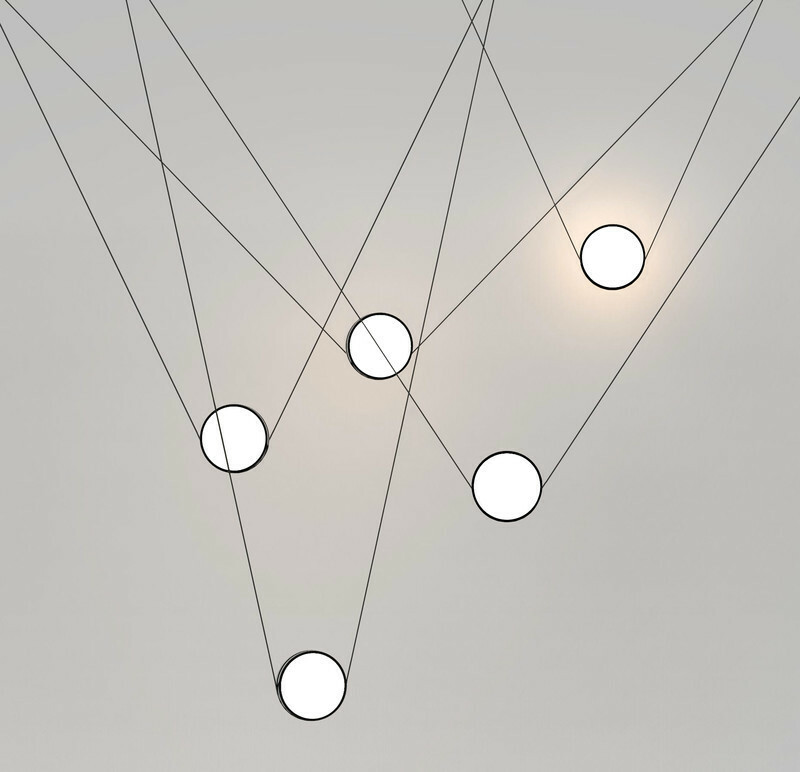 Lightemotion's signature work has given it an international reputation through its work on major projects in Canada, Europe, the United States, Asia, and the Middle East. 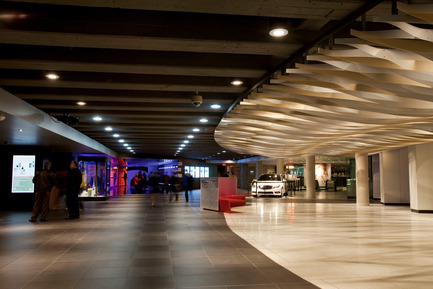 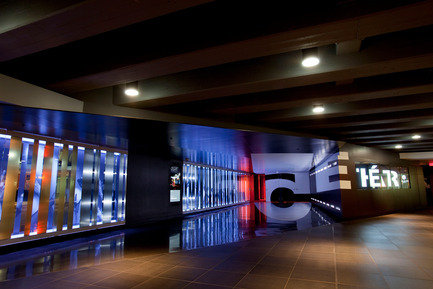 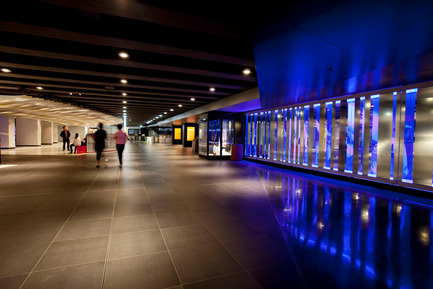 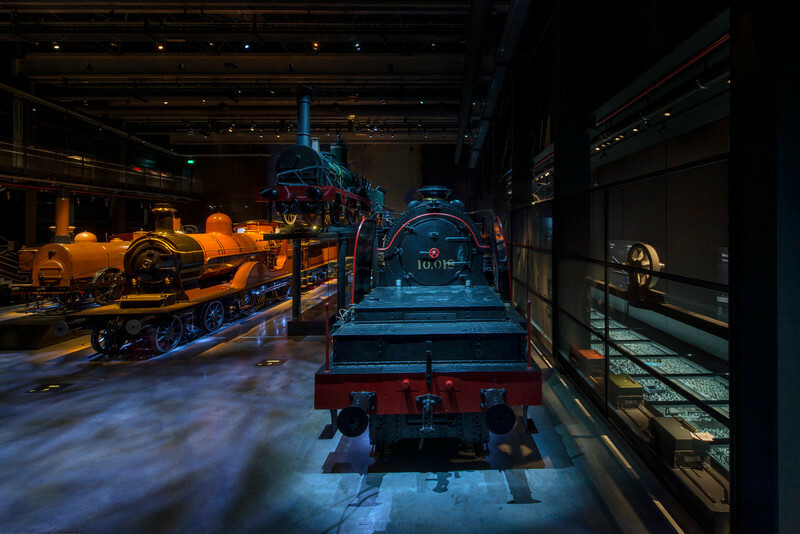 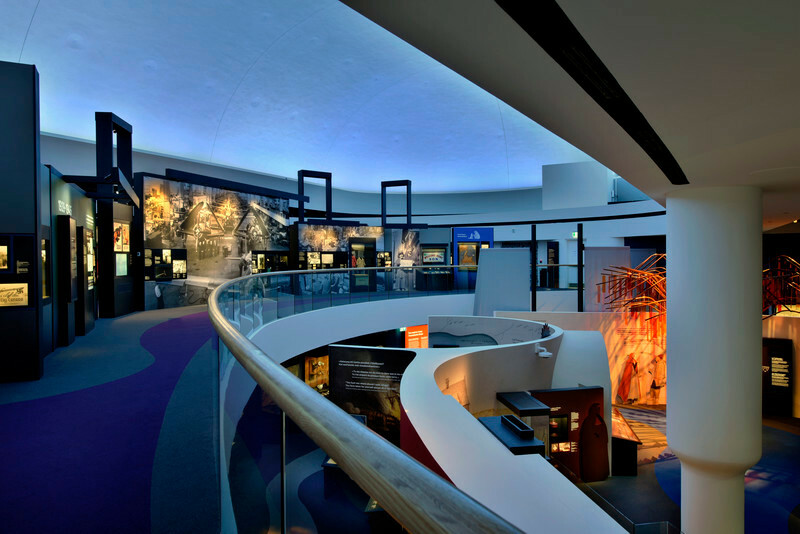 Recently Lightemotion put its architectural lighting signature on the Indiana Jones travelling exhibit inaugurated at the Montreal Science Centre in May 2011; the Museo Nazionale dell’Automobile of Torino in Italy; the Auckland War Memorial Museum, marking its 80th anniversary; and the Wine Museum of Barolo in Italy. 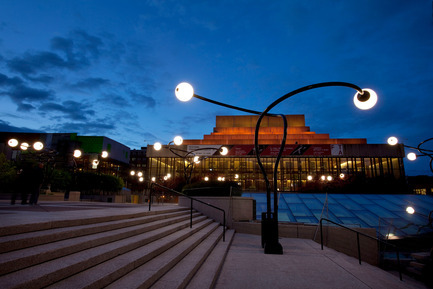 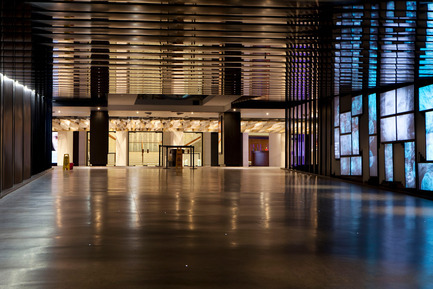 The Montreal company also created the dramatic lighting design for the Canada Pavilion in Shanghai 2010, as well as The Residences at the Ritz-Carlton, Montreal, which will be opening in 2012.